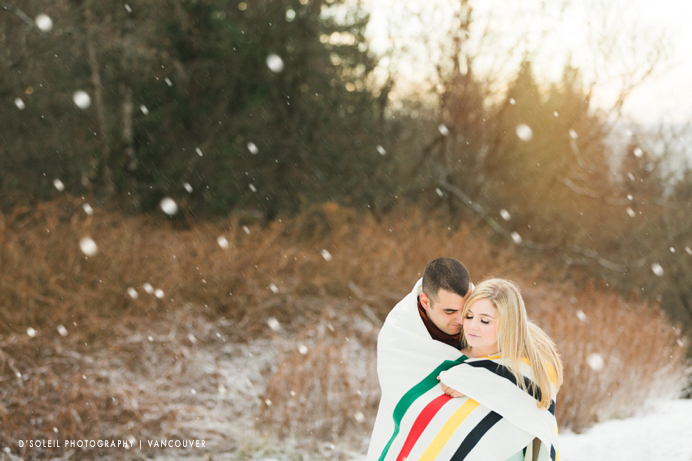 Our first snow engagement session of 2016! 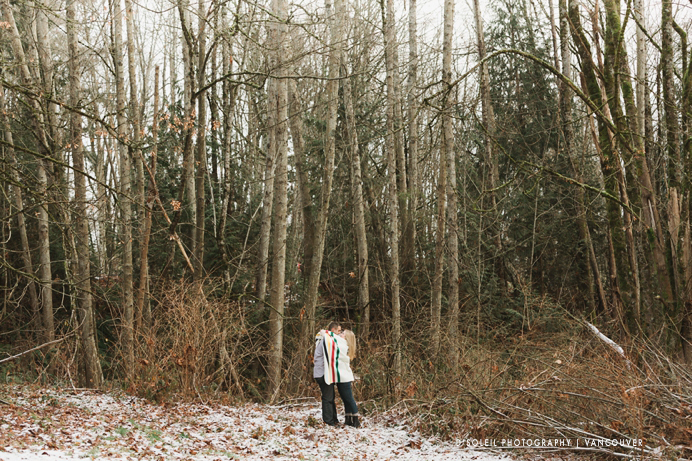 Atop Burnaby Mountain, we found a snowy clearing with beautiful views of Vancouver and the surrounding areas. 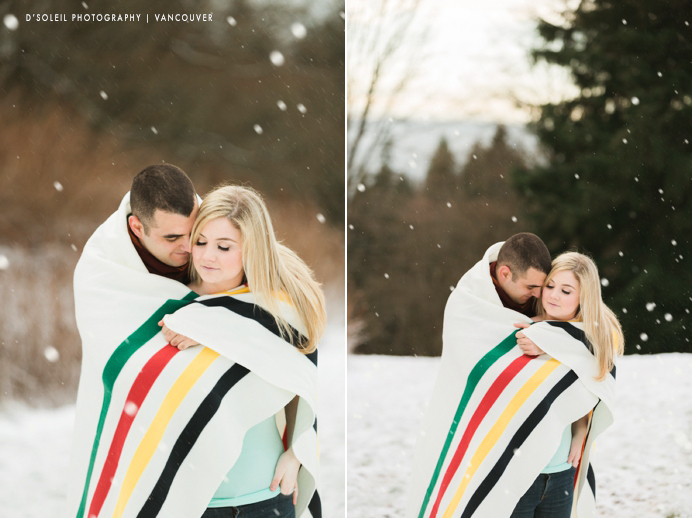 Stephanie + Daniel brought a warm Hudson Bay’s multi stripe point blanket to the snow engagement session, and just like that, their photos turned Canadiana. 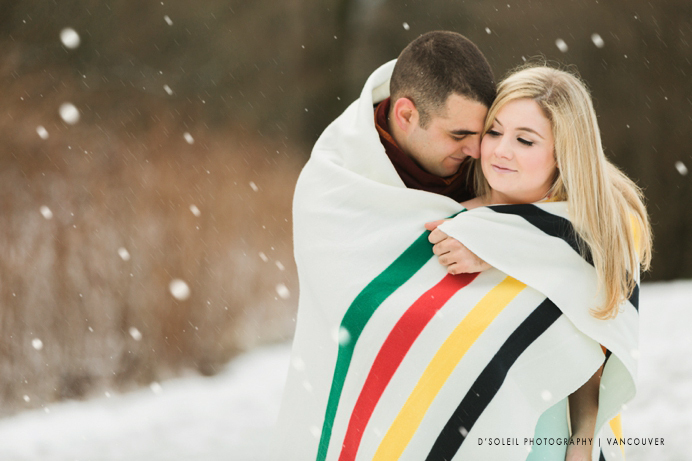 One of the most enduring symbols of Canada’s past is this Hudson’s Bay point blanket – add it to any winter engagement photo session to make it a truly Canadian one. 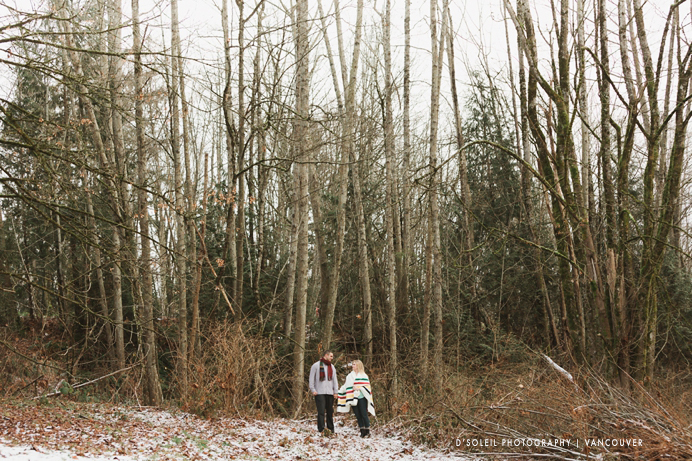 What I loved most about this session was the snow. We get so little snow here on the West Coast of BC that it is still magical when it falls. On this day, most of the snow we encountered was in the form of ice on the ground, but nevertheless, it felt right to see the white stuff on mountain top in January. Had it not been for traffic, we may have been on Seymour Mountain instead, but on this day, Burnaby Mountain was the perfect spot. We found a quiet clearing on the mountain and spent time there. Had it been on any other mountain, we would have been surrounded by skiers and tourists enjoying the last nice weekend before the first work week of the year. 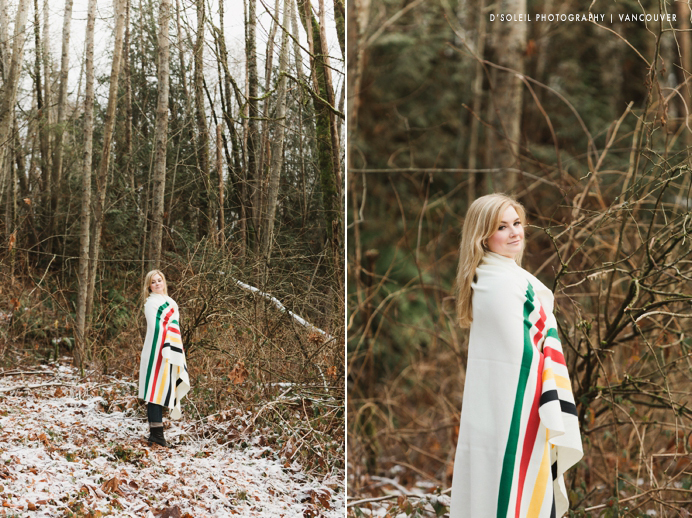 I especially love how the colourful Hudson’s Bay point blanket could easily be made into a warm winter shawl. Set against a wooden background, the contrast adds that warm rustic feel of a Canadian wilderness. 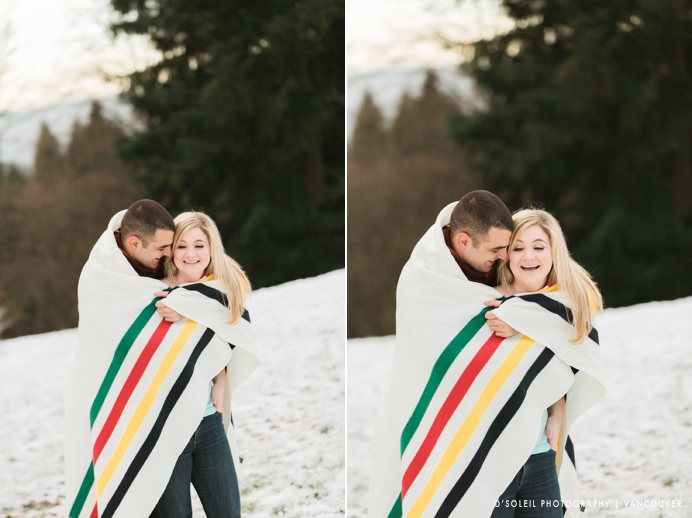 I usually ask couples to bring personal items to their engagement session, and Daniel chose just the right item for the cold weather. The scarf added that perfect touch of colour, while being appropriate for the session theme. 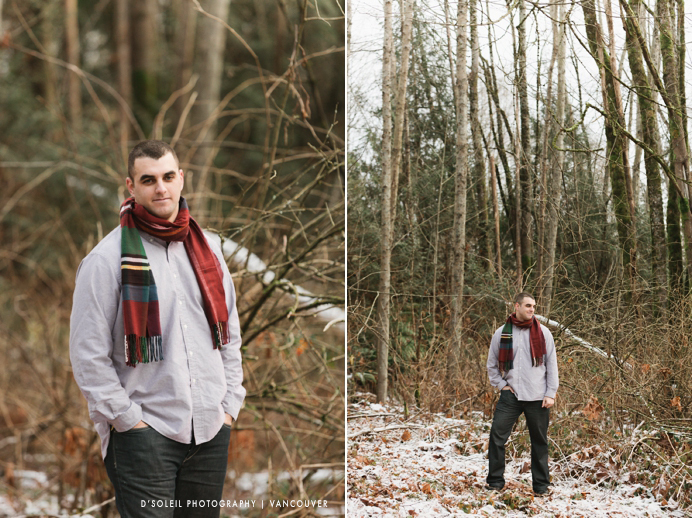 If you are interested in an engagement session, please contact us for photographer availability and rates! We’re now even booking for 2017!